All of the pottery from the Old Farmhouse is handmade by David Hendley. Most of the pottery is made with the potters wheel and/or the clay extruder, and David formulates and mixes all the clays, slips, colors, and glazes. 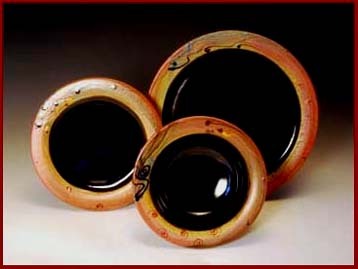 The pottery is fired to 2400º F in a wood fired kiln. All pieces are oven, microwave, and dishwasher safe and are quite durable. All of the pieces pictured here are sold, but similar ones are usually available for sale. The bucket has a removable brass bail with a clay handle. 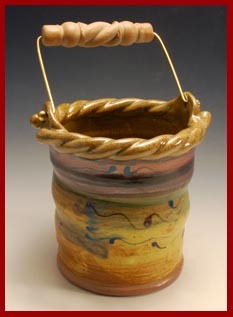 The step-by-step instructions for making this pot are in the July/August 2008 issue of Pottery Making Illustrated magazine. These drinking tumblers were extruded and then thrown on the potters wheel. 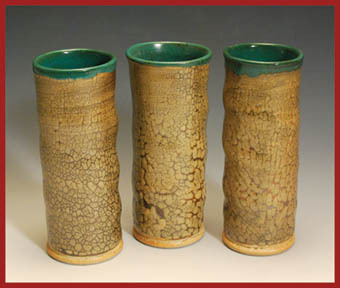 The reticulated glaze is formulated with volcanic ash from West Texas. 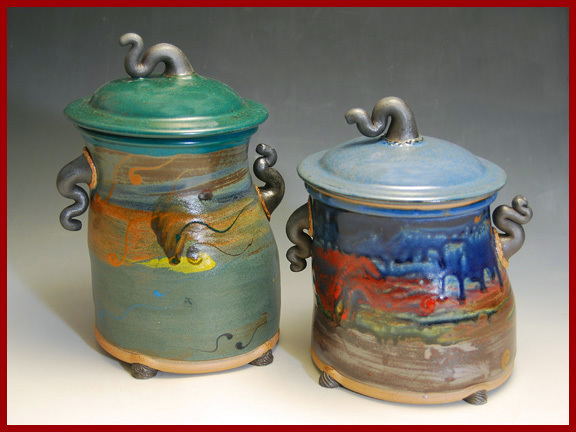 Footed mugs and lidded mugs. 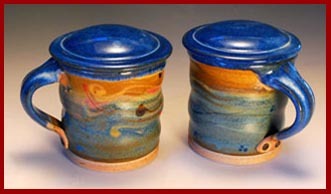 Both styles feature a rich cobalt-rutile glaze. 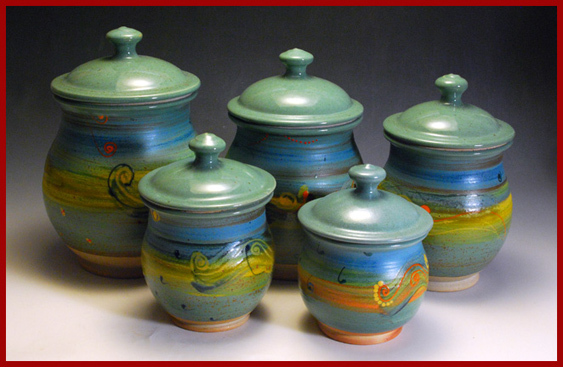 Canister set in greens, turquoise, and yellow. Off-center wavy jars. These jars were half-way thrown on the potters wheel, then moved off center and thrown the rest of the way, resulting in a "shift" half way up the pots. the handles are made with oxide-saturated black clay. Communion Set. 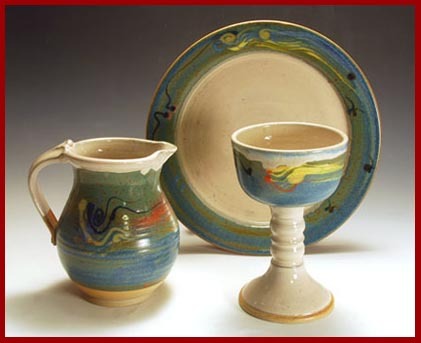 Three-piece communion set of chalice, plate (paten), and pitcher. 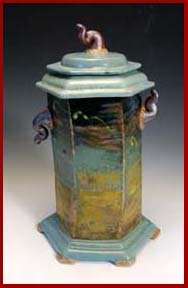 Ivory glaze with sea green, turquoise, and yellow slip glazes. The plate is 10 1/2 inches in diameter. Extruded jars and vases. 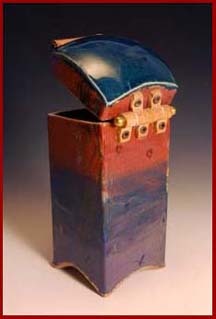 The basic shapes for these pots were formed with a clay extruder. David built his clay extruder and makes all the dies to form the different shapes. 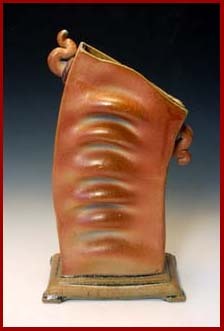 To make the "wrinkled vase", the clay was manipulated and wrinkled as it was coming out of the extruder. The bodies of these oil bottles were extruded, then the necks were thrown on the potters wheel. 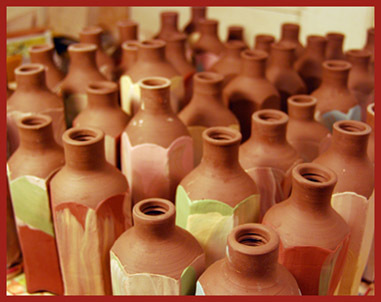 A group of just-made bottles, decorated and drying. 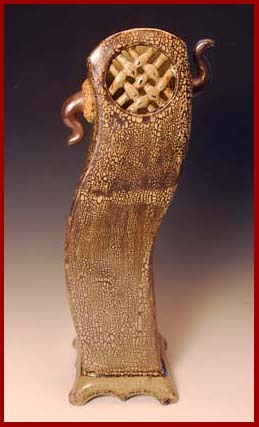 Smaller items such as these are usually made in groups of 24 to 30. 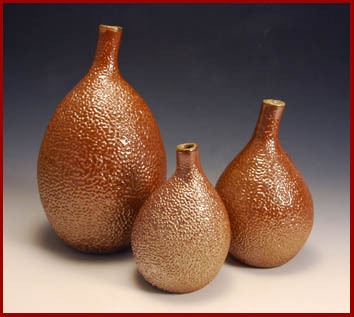 These asymmetrical "Gourd Bottles" are glazed with a West Texas volcanic ash glaze that beads up into a textured surface in the kiln at about 2000°. 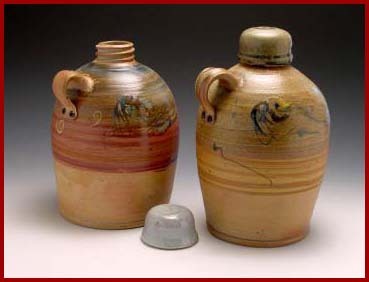 (left) These one gallon "moonshine jugs" have threaded screw-on lids. 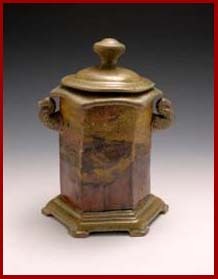 (right) This square extruded container has a hinged lid made of clay, with a brass hinge pin. 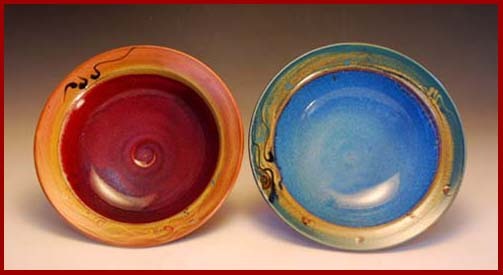 Serving Bowls, copper red and titanium blue glazes. The interior of the red bowl is glazed with "Simply Red" (see "Writings and Publications" page for a reference to the article). 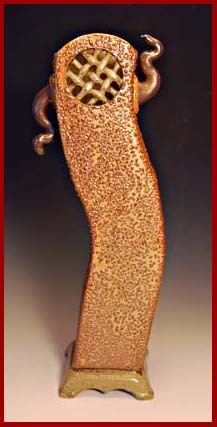 The blue glaze is made with the same base glaze, but with the addition of rutile. 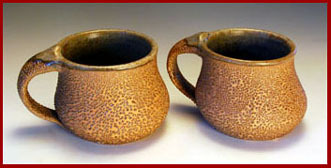 These "Pony hoof mugs" are glazed with a volcanic ash glaze that makes a smooth coating when applied, but beads up into a textured surface at about 2000°. 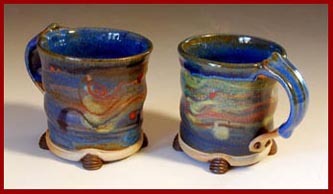 More slip-glazed footed mugs. 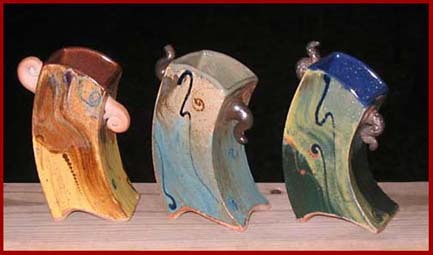 Similar mugs are available for sale on the "Pots for Sale" page. Bottles with screw-in stoppers. 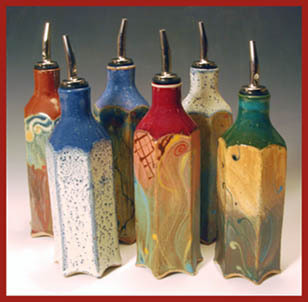 The screw-on lids and stoppers were made with special tap-and-die sets for potters. 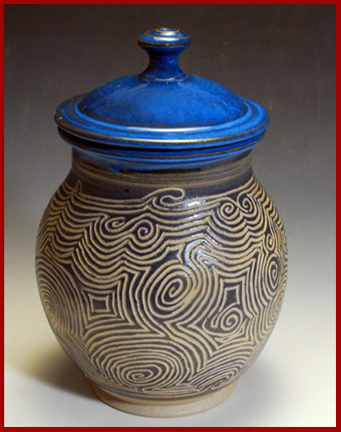 David wrote his Master's Degree thesis about ways to make pottery with locking and sealing lids, and has been making pottery with unusual closures for 30 years. 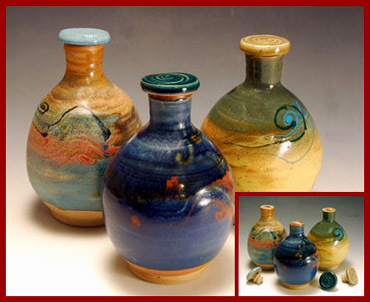 Similar bottles are available for purchase on the "Pots for Sale" page. 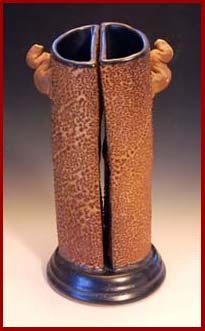 Carved vase and jar. 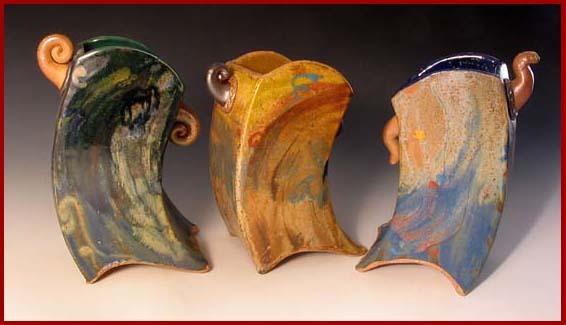 These pieces were painted with slip glaze while the clay was still wet. 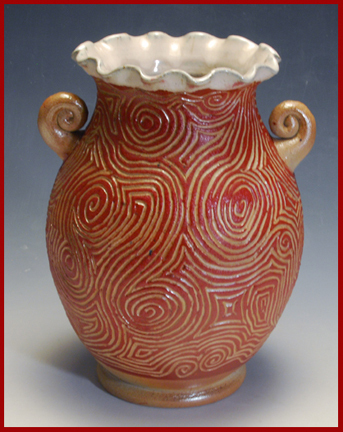 Then, when the clay was half-dry, the designs were carved through the glaze into the clay. 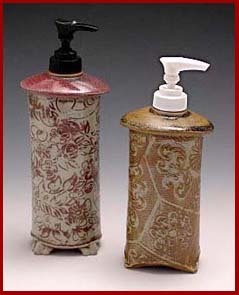 (left) The bodies of the lotion jars were extruded and then textured with embossed paper. (above) Small 4-inch diameter "berry feet" footed bowls. 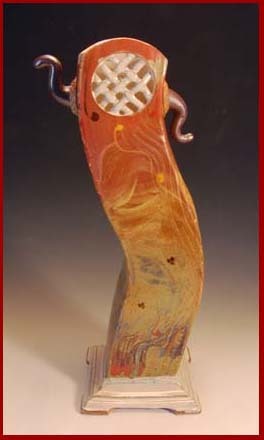 17 inch tall "wavy vases with windows". The basic forms for these pieces were made with the clay extruder. 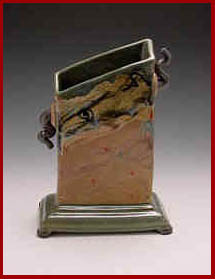 The glazes are volcanic ash glazes on the exteriors and wood ash glazes on the interiors. 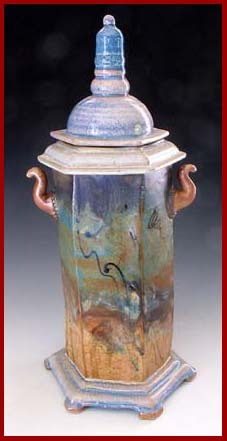 Another tall extruded hexagonal lidded jar, "The Spire Jar", and a slip-decorated "Wavy Vase with Window". These "Dancing Squares" are small extruded vases, about 4 1/2 inches tall. These large "Dancing Squares" are 8 - to - 9 inches tall. Dinnerware place settings glazed with mottled ivory glaze (left) and traditional Japanese "tenmouku" black glaze (right). 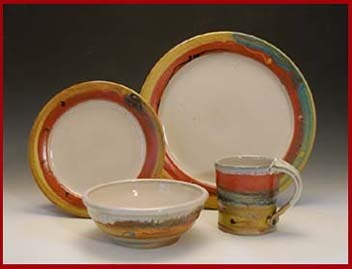 Although he occasionally makes a dinnerware set that is not an order, David makes most sets on order, so the buyer can have the exact pieces, colors, and decorations they desire. 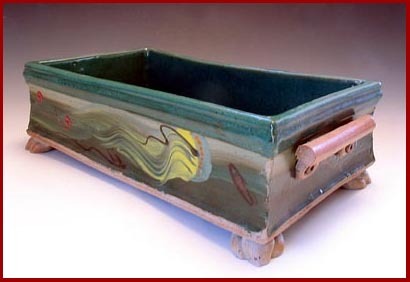 This rectangular dish was built with extruded sides, handles, and feet and a slab bottom. 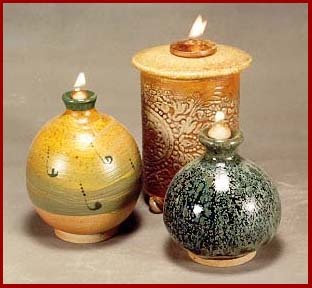 Oil candles have Fiberglas wicks and burn regular or scented oil.